If you’ve recently experienced the death of a loved one, then you may have many questions about the probate process used to settle his or her estate. Probate is a court-supervised process that determines the validity of wills and facilitates the transfer of assets to heirs. Its complexity can leave many families with difficult questions about the process, as well as the role of the legal system. There are a variety of ways in which you could be impacted by the probate process, whether you’re a named executor for the will, someone with an interest in contesting it, or simply an heir awaiting your inheritance. Many of the questions that you’ll have will be difficult to answer on your own – especially while you’re still dealing with the grief you’ve endured from the loss of your loved one. Why Might I need legal representation during probate? How can a California probate attorney help me? In California, the probate process is used to settle the status of all decedent assets that have no other means for transferring ownership after death. Typically, this means that bank accounts, homes, vehicles, business interests, and most other personal property can be subject to probate when someone dies. It also means that any assets that automatically transfer ownership can be settled without going through this court-supervised process. So, for example, a solely-owned bank account would need probate to pass to heirs. An account with a payable-on-death provision would automatically transfer to the designated beneficiary when the account holder dies. A home owned in your name would require probate; one owned in joint tenancy with another person would not. Requesting that the court formally close the estate once all these duties have been fulfilled. If you’ve been named as an executor of a will, there are a host of responsibilities that need to be addressed – and many of these duties require legal assistance. As executor, you have been given a set of obligations that can sometimes be difficult to fulfill. A California probate attorney can assist you with the probate process to ensure that you faithfully meet all your obligations under the law, while properly honoring the deceased’s final wishes. Obviously, executors typically need the most legal advice during probate. In fact, many experts recommend that executors contact a probate attorney as soon as they know that they’ve been named to serve in that capacity. That attorney can help to ensure that you fully understand your responsibilities at every stage of the process. Those who want to challenge the will generally require legal help too. Challenges to wills are seldom easy, and can involve complex legal questions that most lawpersons are ill-equipped to deal with on their own. If you have cause to believe that your loved one’s will is somehow invalid, you should only make those claims after consulting with a competent probate attorney. Heirs to an estate generally have little or no contact with the probate court, but will often have at least some minimal contact with executors. If you’re an heir, however, that doesn’t mean that you shouldn’t have legal counsel – especially when your inheritance is sizeable. In some cases, an attorney can facilitate more effective communication between you and the estate executor, and ensure that all your legal interests receive the protection they deserve. Probate attorneys have always had a role to play during the settlement of estates, so it is important to recognize how you can benefit from these services too. Regardless of your reason for being involved in the probate process, you will have vital legal interests that are deserving of legal protection. San Jose Probate Attorneys can ensure that those interests receive all the protection the law provides. 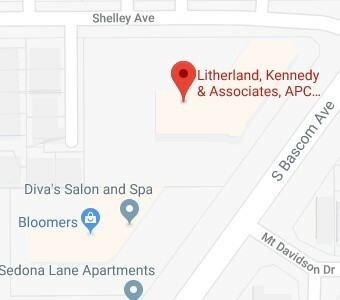 At Litherland, Kennedy & Associates, APC, Attorneys at Law, our experienced probate team can work with you to help you with executor duties or aid you as you seek to facilitate receipt of your inheritance. We know how difficult it can be to cope with this legal process during any period of grief, and will work to ensure that your experience with probate is as stress-free as possible. Call us today at (408) 356-9200 in Campbell or (831) 476-2400 in Aptos to receive your free probate consultation.